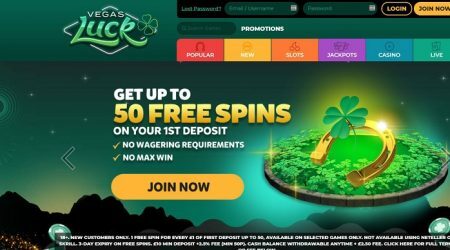 Vegas Luck Casino might be the new kid on the block, but this online casino that was founded in 2018, has already made a massive mark in the world of gambling. They focus mainly on slots and live games while working with some of the biggest names in the industry such as iSoftBet, Bally, NetEnt, Playtech, NextGen Gaming, IGT, Eyecon, Barcrest, WMS and IGT. If it is high risk, high rewards that you are after, look no further. Playtech's Age of the Gods series and Blueprint Gaming's Jackpot King titles are just two of the 70 jackpot games on offer. The design of their site is seamless, simple and navigation is easy. It is a non-download casino which means that players can spin the reels from their tablet, desktop or mobile device. 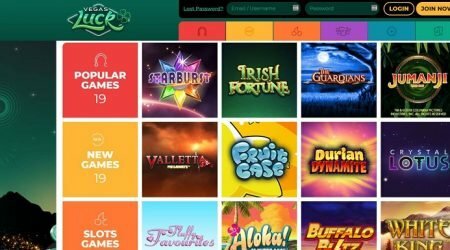 The guys at BGO Entertainment were as innovative as always when creating this fun-loving Irish themed casino complete with regular lucky charms such as the four-leaf shamrock. If you are thinking about testing this casino out, you can expect to receive incredible offers when making your first deposit. And, the biggest perk is that they offer wager bonus spins, which is almost unheard of. The table games in the live section include blackjack and roulette in many different varieties as well as many other exciting games. They have passed the rigorous fair-play and security tests which have earned them licences from Alderney and the UK. It is not uncommon for new online casinos to offer new, as well as existing players, unbelievable bonuses, but Vegas Lucky takes it to the next level. If you are an online casino enthusiast that doesn’t enjoy having to play through wagering requirements on bonus spins when signing up to a casino, Vegas Luck is a dream come true. Vegas Luck decided to do things a little different and canned the idea of the traditional welcome match bonus. Instead, they offer you bonus spins when making your first deposit. What is so special about this? Well, the bonus spins are wager-free, and there is no cap on the maximum win. They also allow you to use these wager bonus spins on some of NetEnt’s most popular slots such as Starburst, Wild Wild West: The Great Train Heist and Lights and many more. When playing with bonus money, you will soon bump into a pesky term called wagering requirements. This is when you need to play through your bonus amount multiplied by the wagering requirements before you will be able to withdraw your winnings. Generally, all bonus offers or promotions are subject to this rule, except for the Vegas Lucky bonus spins offer. Players receive one bonus spin for every €1 spent and can use the spins to win and withdraw an unlimited amount of money, without wagering. Vegas Luck constantly runs exciting promotions in many shapes and sizes. The Big Vegas prize draw gives players the opportunity to stand a chance to win a 5-night stay for two in the iconic Bellagio hotel, including flights. Every time you earn a diamond, you earn one prize draw ticket that will take you one step closer to sipping cocktails by the pool on the Vegas Strip. They also have a brilliant rewards program – The Reward Store. When you spend €10 on any slot, you earn 1 Diamond and 0.1 Diamond for every €10 spent on any table game. What is so special about these dazzling diamonds? Well, you can exchange these precious gems in the Rewards Store for either bonus spins or bundles of real cash – the choice is yours. Not only do they let you collect fantastic lucky charms along the way, but they also offer you an incredible selection of slots and games from the most respected developers in the industry. If you head to the top, you will find the most popular slots such as NetEnt’s Planet of the Apes. This new slot gives you the opportunity to play in dual modes – Rise Mode or Dawn Mode. Both modes offer different bonus features and bonus spins, and there is also an exciting stacked wild feature. It is truly brilliant. In the new section, you will find some of the hottest releases such as Quickspin’s Volcano Riches. This thrilling new Polynesian-themed slot offers loads of entertainment such as dancing hula girls as a stack feature. Playtech’s Age Of Egypt is also definitely worth a shot as well as iSoftBet’s Tree of Fortune. And, if you feel that luck is knocking on your door, you can hop over to the jackpot selection where you might win whopping amounts of cash playing Age of Gods or Gladiator. By now you might have realised that Vegas Luck Casino is focused squarely on slot enthusiasts that enjoy the odd table game now and then. They have over 350 slot games in their library which are pretty impressive considering that they opened their virtual doors in 2018. The navigation on their site is really simple, and if you know what slot you want to play, you can make use of the search facility at the top of the web page or you can be adventurous and choose one of their recommendations. The deposit and withdrawal options are as seamless as their user interface with a wide variety of options that will suit every player. The deposit methods include credit cards, bank transfer, EcoCard, Citadel Banking, Neteller, PayPal, paysafecard and Skrill, while the withdrawal methods include Neteller, Skrill, credit card, Citadel Banking and bank transfer. The minimum deposit amount is €10, and the minimum withdrawal is €20. The maximum withdrawal amount is €5000, and they aim to process withdrawals within 24 hours. After this, however, the time frame will depend on which withdrawal method you used. Usually, you can expect your funds to appear in your account within 3-5 business days when using Visa and Mastercard, while e-wallet solutions usually aim at delivering a shorter payout time frame. All methods are safe, convenient and easy to use. 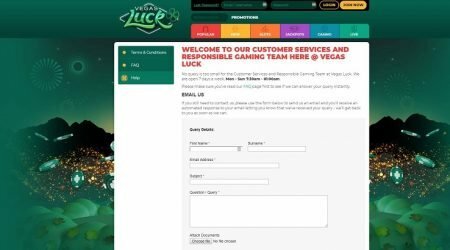 The design of Vegas Luck Casino’s website is really simple and everything is where you would expect it to be. You will find a live chat section and telephone option on one side, and the FAQ section has most of the necessary information that you might need. It covers promotions and bonuses, deposit and withdrawals, registration and much more. If you don’t find what you are looking for, use one of the other options. The recommended route is the live chat option that is available between 7:30 am and 1 am (UK time) – it is really simple to use. Click on the option to open the speech bubble and wait a few minutes to be helped. If you email, you might have to wait a couple of hours for your questions to be answered. The support team is very helpful and knowledgeable and will get back to you as quickly as possible. Often online casino players get a lucky feeling about an online casino straight away and this new kid on the block will give you that feeling. This might be because of the lucky charms such as the four-leaf shamrock, or maybe it is the fantastic selection of games available from NetEnt, Playtech, IGT. The unbelievable bonus spins with no wagering requirements or maximum win is also a good reason to give them a go. You also get the chance to win many prizes and could find yourself jetting off to Vegas in the near future. If not, you can use your diamonds rewards points to withdraw stacks of real cash. The excitement never seems to end. We also like the fact that it is user -friendly and uncomplicated and that there are many withdrawal and deposit methods. Incorporate all of this with brilliant customer service, and you get one of the hottest casinos out there.